Summerhill Equestrian Center offers horseback riding lessons in Santa Clarita, CA. Lessons are available from beginning to advanced riding. Whether you are interested in Hunters, Jumpers or pleasure, we can help you reach your goals. 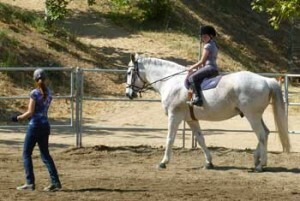 Summerhill offers a safe environment for both horse and rider to begin or continue their training. Our facilities are lighted, and our arenas are groomed daily to provide proper footing for the horse. Summerhill’s facilities are well back from major roads, providing a safer and more peaceful environment to learn in. At Summerhill Equestrian Center, we will work with you and your horse to achieve the goals you’re looking for. 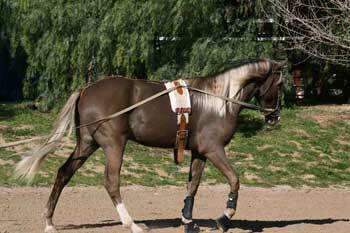 Our horse training programs are designed around what you want to accomplish with your horse. The key to success is consistency and patience. We can customize a training program to fit your needs and keep within a budget you are comfortable with. Horses in our training program are treated as individuals; each horse will have its own time requirements while in training. We do not believe horses should be pushed faster than they are physically or mentally able to handle so we develop individual programs to reach the goals of both the horse and the owner. Lessons and training available for Hunters, Jumpers and pleasure. Please contact us for information and pricing.